User contributions are a key part of our Social Menu. We will always strive to make our software as easy and intuitive to use as possible. So when it comes to The Ultimate Food App, we make sure that it is as simple as possible to add to the Social Menu. From the main page, you’ll be able to add your own dishes with the tap of a button. And after you’ve taken the photo of the food, you can snap shots of you and your friends and upload them directly to your social networks. You can also add or update a restaurant as well. Plus take pictures of the restaurant. Anyone can add reviews of existing dishes and restaurants. Of course, this brings to mind a couple of issues. The foremost of these would be your privacy and that of your friends. 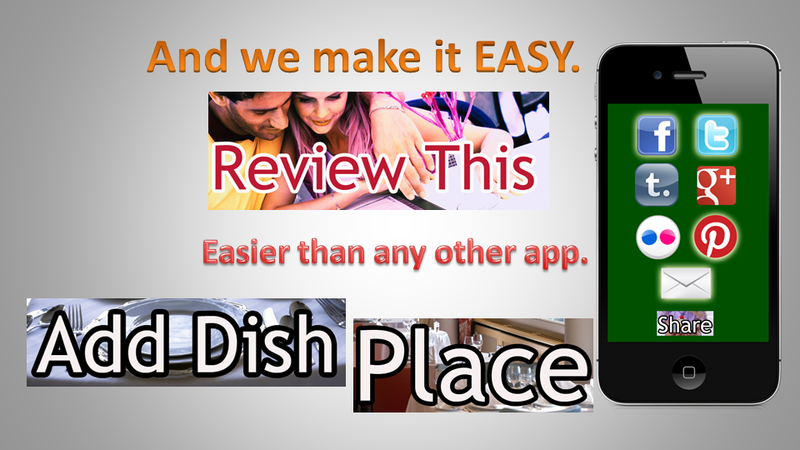 By default, dish and restaurant postings and reviews are public and become part of the worldwide Social Menu. But the pictures you take for your social networks are by default sent only to your networks and NOT to the Social Menu. Once submitted to Facebook, for example, the photos go directly to your Facebook wall and whatever privacy settings are in place for your wall will kick in. And we keep no trace of those photos in our database. On the other side of the coin, how do we make sure that the photos that go on the Social Menu are appropriate? We can put in filters to find objectionable material, but those are notorious for errors. So we can also back this up the same way all the social networks do: by allowing you to report photos you find objectionable. And what about the restaurants? There has been a lot of publicity lately about how easy it is for critics to issue scathing reviews of restaurants. And that’s just from professional reviewers. With the internet, everyone’s a critic and a lot of this activity comes from people acting anonymously, doing and saying things they normally would not do in person. Many of you reading this will recall the awful pizza posting that made us realize the world needed a better way and a better app. So well before the recent Times Square review controversy, we knew that restaurants needed a way to protect themselves from potentially unfair reviews. And so we had developed our Arbitration Program as a means for restaurant owners and managers to actively request that reviews be investigated. But since it’s a Social Menu, the Arbitration Program involves us getting reviews from people like you to test the validity of the bad review. It’s fair, it’s unbiased, and it controls irresponsible posts. ← Thanksgiving Meals for the Hungry?